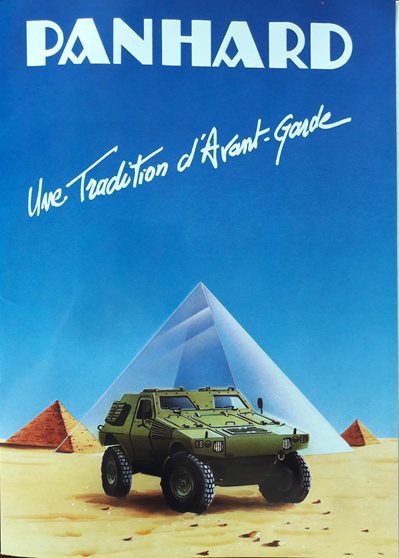 Launched in 1978, the invitation to tender from EMAT (Land Army authority) led Panhard General Defense to propose a lightweight armoured vehicle which was selected in 1985. The VBL is a wheeled, amphibious, armoured vehicle with great mobility, and was designed for reconnaissance and infiltration missions. Its design followed the rule of three: 3 tonnes, 3 metres long, 3 crew, space divided into 3 (2/3 for the cab and 1/3 for the engine), 3 doors and 3 hatches on the roof. Book : Yves Debay, VBL Panhard, Histoire et collections (Histoire and collections), 2004.